The existence of this Linux distribution slipped completely under my radar until this morning. I am excite! 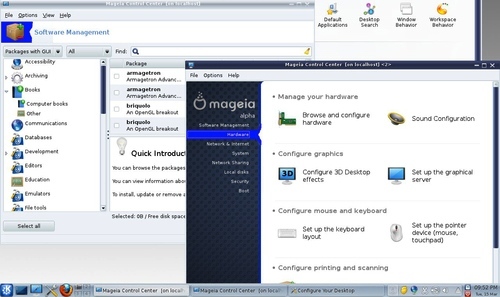 The Mageia project announced the release of Alpha 2 of their inaugural version 1, expected June 1. Developers have made a clear statement that this release is only for developers and bug hunters. It is not for daily use, any kind of production environment, or review. Tsk, tsk, they should know better than that. Reviews are inevitable. As you may have heard, the future of the Mandriva Linux distribution is unclear. Most employees working on the distribution were laid off when Edge-IT was liquidated. We do not trust the plans of Mandriva SA anymore and we don’t think the company (or any company) is a safe host for such a project. Many things have happened in the past 12 years. Some were very nice: the Mandriva Linux community is quite large, motivated and experienced, the distribution remains one of the most popular and an award-winning product, easy to use and innovative. Some other events did have some really bad consequences that made people not so confident in the viability of their favourite distribution. People working on it just do not want to be dependent on the economic fluctuations and erratic, unexplained strategic moves of the company. That last paragraph sounds like an OpenSUSE user talking about Novell! That reminds me, of all the Linux distributions I tried over the years, I thought SuSE's YaST was the best graphical installer and system configuration tool. And its German, which automatically made it full of awesomeness. But I digress! I used Mandrake in the early 2000s, even still have the original carton, CDs and user manuals I bought from Challenger! I can sense another pointless nostalgia post coming. Anyway, it's good to see it'll still be living on in spirit :).